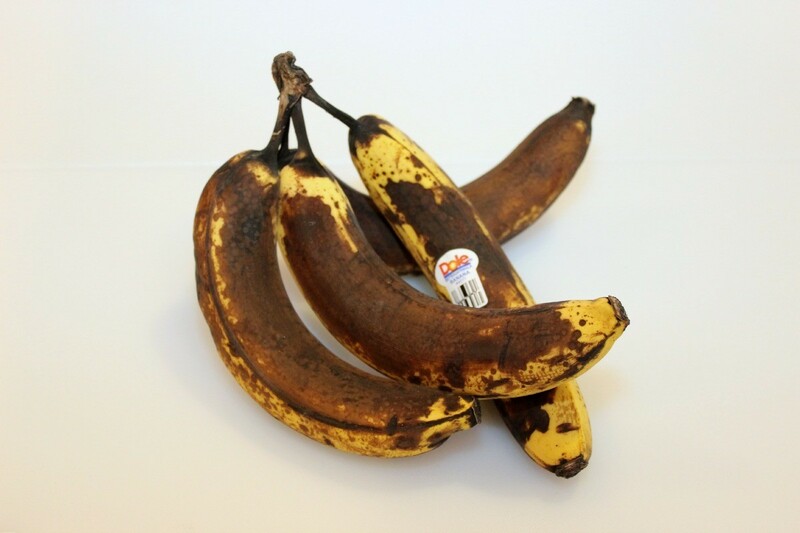 Even when they get too ripe to eat there are still many recipes that call for overripe bananas. This is a guide about using overripe bananas. How can I use over ripe bananas? Preheat oven to 350 degrees F. Grease and flour (or line with parchment paper) two 9 x 5 inch loaf pans. Sift the flour, salt, and baking soda into a large bowl. In a separate bowl, cream together the butter (or margarine) and sugar until smooth. Stir in the mashed bananas, eggs, and walnuts until well blended. Pour the wet ingredients into the dry mixture, and stir just until blended. Let the loaves cool in the pans for at least 5 minutes, then turn out onto a cooling rack, and cool completely. Wrap in aluminum foil to keep in the moisture. Ideally, refrigerate the loaves for 2 hours or more before serving. * For muffins, preheat the oven to 375 and bake for about 20 minutes. Use cupcake/muffin liners so you don't have to grease the muffin tins. If they are black inside as well as outside, bury them at the base of a rose bush or other shrub. As they decompose they feed the plant healthy nutrients. Yeah i've never made banana bread but I do freeze my bananas for banana pancakes - they're the best!! So yummy and delicious. Don't eat them, instead make a gorgeous facial mask by mashing it up, adding a splash of honey & leaving it on for 15 minutes. It smells delicious. You can puree them, and use them in French toast batter. Or else you can also use them in smoothies along with any berries you have, and some milk. Even if they have turned dark, don't worry because the french toast/smoothie will still taste great! Cut in half, sprinkle with sugar and cinnamon and saute in a pan with a little butter till softened.....delicious! You can make a banana milk shake. Cut these bananas into pieces depending upon the size of the banana and grind them (don't need a juicer for this as banana's very soft). Add milk, then add yogurt (only a couple of tablespoons. Yogurt should be put in to remove the milk smell while drinking. If you are OK with the smell, don't have to add yogurt). Add sugar (ripe banana's are generally sweet, so sugar may not be necessary). You may add honey instead of sugar to make it healthy and fat free). You can make it thick by adding less milk and eat it or add more milk (little milk and little water can be used) to make it watery and drink it as a banana milk shake. It hardly takes any making time and is also healthy as it contains banana and milk. can be had at room temperature or cold. Tastes good in any way. You can also make banana crunches. Take besan flour, add water to make a semi solid, add required salt. Cut the banana's into 4 inch pieces. Dip these bananas into the mixture and deep fry. You can spice it up with chillies by adding chili paste in besan. Kids will like it. These puffs are yummy plain, but also taste good sprinkled with powdered sugar or gently spread with your favorite jam or jelly. Combine the flour, sugar, and baking powder in a bowl until thoroughly mixed. Stir in the bananas, vanilla extract, and water to make smooth sticky dough. Heat the oil in a deep fryer or large saucepan to 350 degrees. Scoop up about 1/4 cup of batter with a large spoon and use another spoon to push it off into the oil. Fry in small batches of 4 or 5 until they float to the top and turn golden brown, about 3 minutes. Flip them over to fry the other side. Remove from the fryer and let drain on paper towels. You can also mash some up and add it to whipped cream. How long are extra ripe bananas good to use? I have some very black ones and want to use them in banana bread. If my bananas are "too ripe" to eat. I put them whole in a freezer bag and thaw as needed. The only way I would throw away a banana is if I forget to freeze them and they are oozing out of their skin. I've also never had a problem using them once they are frozen, banana bread, banana oatmeal pancakes, cookies. What can I do with overripe bananas? They are black, but I don't want to throw them away. If you have leftover, over-ripe bananas, don't throw them out. Use them for banana bread or even banana pancakes. Banana pancakes are probably the most moist, heavenly pancakes our family has ever tried. Sift the flour, salt, and baking soda into a large bowl. In a separate bowl, cream together the butter (or margarine) and sugar until smooth. Stir in the mashed bananas, eggs, and walnuts until well blended. Pour the wet ingredients into the dry mixture, and stir just until blended. Divide the batter evenly between the two loaf pans. My family loves monkey tails. We take our overripe bananas, cut them in half put a Popsicle stick in the flat end freeze them on wax paper. Then dip them in melted chocolate, we buy the tub of chocolate from the produce section for strawberries.